This Easter treat the whole family to a fabulous experience that brings dinosaurs to life. Jurassic Kingdom is an extraordinary, new animatronic prehistoric experience that is touring parks in major UK cities during 2017. It includes over 30 true-to-life dinosaur models and installations that will make you feel you are being transported back in time to when they ruled the world. I visited the London experience that is located at the beautiful Osterley Park with my wife and two children and we all had a fabulous day out. As we entered the experience, the first dinosaur we saw was the amazing true-to-life T-Rex. This excited my two children straight away and set the scene perfectly for our dinosaur experience. As we walked through the experience we saw lots of different dinosaurs, some were life size as well which was very interesting and fascinating to see. Seeing a life sized Diplodocus truly was amazing as we all were in awe with regards to the size of this dinosaur. All the dinosaurs were animatronic so moved to make the experience more true to life. The roars from the dinosaurs also made the experience even more enjoyable. My two children thoroughly enjoyed this experience and they learnt a lot about dinosaurs, not only about their size but they also learnt some facts about each dinosaur. Each exhibit had a plaque full of information about the dinosaurs we were looking at. We also saw some dinosaurs fighting each other which again was very interesting. The dinosaurs were situated inside Osterley Park so walking around the experience was lovely. We visited on a sunny Spring day so we loved being outside in the sunshine. My two children also enjoyed running around the area. There were also wooden swings attached to some of the trees that they loved playing on. They also had the opportunity to visit the Den Area where they could make their own dens using branches and sticks. My two children spent ages here and thoroughly enjoyed making their very own den. I thought the experience was very family friendly as there were spots throughout the exhibit where you could visit the toilet or grab a drink and a snack. I thought this was brilliant as we know little ones often need a break. We also had the opportunity to purchase food before we went into the experience, as there were food vendors at the entrance. They also had face painting and a gift shop here as well. 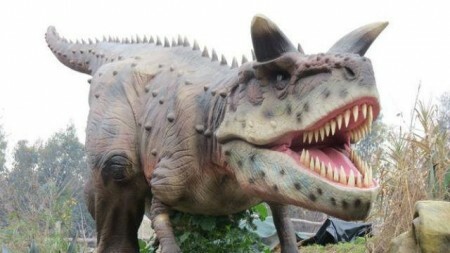 Jurassic Kingdom is a fantastic day out for all the family. We all had a lovely time visiting the experience and also spent some time walking through Osterley Park afterwards. 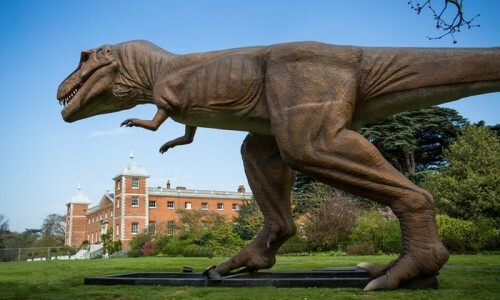 You can easily spend a whole day enjoying both Jurassic Kingdom and Osterley Park. Ticket prices for Jurassic Kingdom London are; Online Prices: Adult £13.50, Child £11.50, Family £46.00. On the door prices: Adult £15.00, Child £13.00, Family £52.00.